Heads up, Merriam-Webster: there’s a new word on the block. It’s called “plogging,” and it’s happening right here in Collinwood. Stephen LoveA hybrid concept combining the Swedish phrase plocka upp (to pick up) and jogging, plogging is the act of picking up trash while jogging. The idea originated in Sweden back in 2016 and is picking up momentum around the world—with races taking place in Malaysia and Canada, and Oprah’s magazine posing the question, “Is plogging the new jogging?’” in its April 2019 issue. 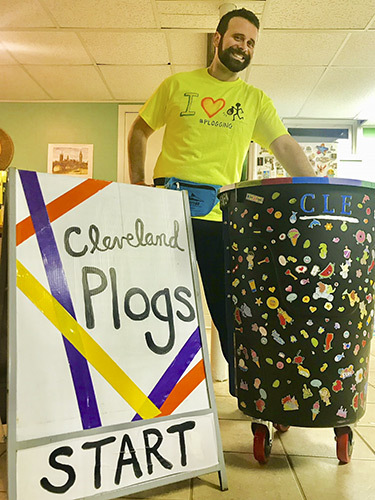 Stephen Love and Allison Lukacsy-Love want to bring plogging to their Collinwood neighborhood—and eventually all of Cleveland. That’s exactly why they’ve started Cleveland Plogs, a new monthly jogging meetup and street cleanup. The Loves are hosting the first Cleveland Plogs meetup next Wednesday, March 27. The jog will start in the Waterloo Arts District and wind its way through a two-mile stretch down E. 156thSt. and Lakeshore Blvd. 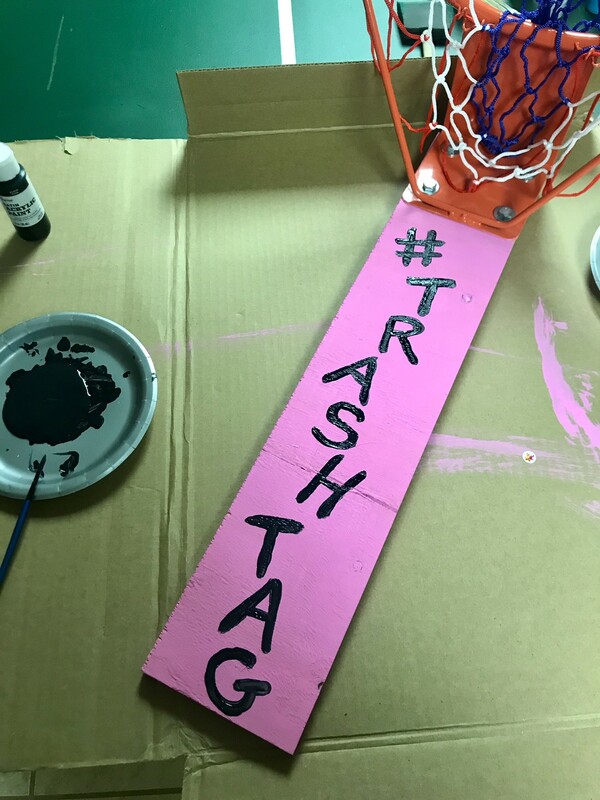 To add an extra element of fun, they convened a group this week to build a decorative rolling trashcan with a basketball hoop attached, and Lukacsy-Love says they plan to wear bright T-shirts and fanny packs for maximum eye-catching impact. 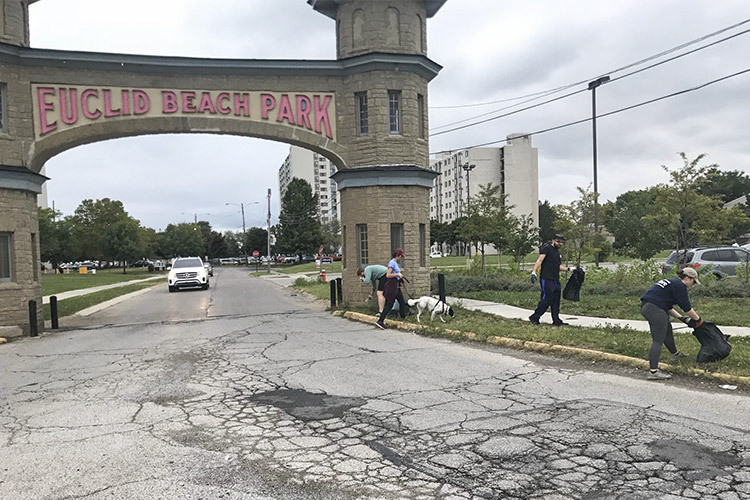 Love is no stranger to mobilizing the community around cleanup efforts—having started the Euclid Beach Adopt-a-Beach campaign (affiliated with the Alliance for the Great Lakes) a decade ago. Along with the first Cleveland Plogs meetup, the Loves are also helping to spearhead the third annual Big Clean event on April 6—which pits residents of Euclid and Collinwood against each other in an effort to see which community can collect the most trash. Last year, more than 200 people participated to pick up over 300 bags of trash. Looking forward, Love hopes that the practice of finding creative ways to combat litter will spread across various Cleveland neighborhoods.